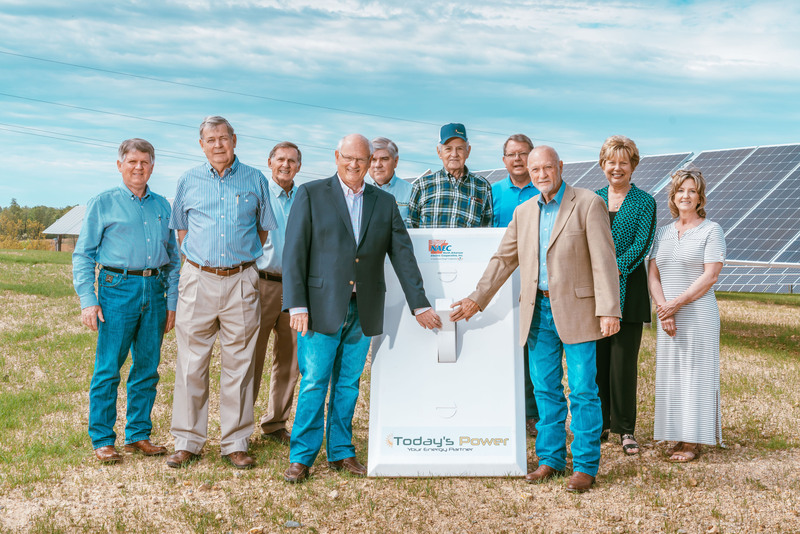 North Arkansas Electric Cooperative’s new 1 MW solar array represents the distribution cooperative’s first owned generation source in its almost 80-year history. The single-axis tracking array consists of 4,009 solar panels on eight acres of land along U.S. Highway 62 near Salem and was constructed by Today’s Power, Inc. Speaking at the April 23 dedication, NAEC CEO Mel Coleman said the project showed NAEC’s commitment to maintaining a diversified mix of generation sources that includes renewables. Today’s Power designed the project that will allow NAEC to secure a portion of the co-op’s energy costs over the 25-year warranty life of the project from clean, renewable and sustainable solar technology. Also speaking at the dedication, TPI President Michael Henderson said the electricity world is changing. “The wisdom and vision shown by North Arkansas’ Board of Directors and management team will provide clean, renewable energy for NAEC’s members for decades to come,” Henderson said. The partnership between NAEC and Today’s Power will not only provide renewable energy but also will show how NAEC seeks to be a good steward of the environment. Quail Forever, an organization dedicated to wildlife habitat conservation, will help develop a habitat important to wildlife within the region. The goal will be to create habitats for pollinators, such as butterflies, bees and other beneficial insects, as well as cottontail rabbits, bobwhite quail and other birds. Plans call for wildflowers to be sown in the fall. NAEC also plans to host educational tours of the site.